Fixed-voltage and fixed-frequency systems tailored to specific needs are surprisingly economical, easy to use, and very reliable. Options list shows the many ways a Behlman BL Series Power Supply can be customized. After reducing the cost of our BL High-Power Series AC Power Sources in 2016, the demand for numerous options became more evident. Behlman Electronics Inc., known for its leadership in providing power products for military shipboard, airborne and mobile programs, as well as for industrial and commercial applications, has announced that their fifteen BL High-Power Series AC Power Sources / Frequency Converters can be selectively customized in many ways, without the typically high cost of engineering a customized power supply. According to Behlman President, Ron Storm, “After reducing the cost of our BL High-Power Series AC Power Sources in 2016, the demand for numerous options became more evident. The V and F options, for fixed output voltage and fixed output frequency, were so popular that we further reduced the cost of these options. A chart showing 13 options is now available on each BL Series specification sheet, to help engineers customize these power sources to better meet their needs. Behlman’s BL High-Power Series AC Power Sources supply clean, regulated AC power in a compact design at competitive prices. The BL High-Power Series with Options V and F are available with either single- or three-phase output in a wide range of power, from 1 KVA to 20 KVA. Inputs are any worldwide three-phase mains power with some models available with single-phase input. The BL High-Power Series delivers all the quality features our customers have come to expect from Behlman: clean sine wave output with excellent line and load regulation, high efficiency, and low harmonic distortion. A multi-pulse input transformer offers low-input harmonic distortion and high power factor as required by MIL-STD-1399. Unique protection circuitry provides over-temperature and short-circuit protection, as well as voltage fold-back during overloads, to maintain undistorted waveforms. Line drop compensation, phase angle adjust, output on/off, and 0-10 V analog control come standard. Options include remote interfaces (RS-232 or IEEE-488) for setting and monitoring a motor test option that has the capability to soft-start motors, pumps and compressors, thereby eliminating the need for higher-power devices. See chart for all options. Small size, quiet operation, and high efficiency make the BL High-Power Series with options V and F ideal for industrial product testing, precision avionic test and power conversion, ATE, bulk power, and motor generator replacement. Other models are available with variable voltage and frequency, using ten-turn potentiometers or remote interfaces (Analog, RS-232 or IEEE-488). Specification Sheets for Behlman’s BL High-Power Series with the options list are immediately available at http://www.behlman.com/products-detail/bl-high-power-ac-power-supplies. Behlman Electronics Inc., (http://www.behlman.com), a subsidiary of Orbit International Corp., manufactures and sells high-quality standard, modified-standard, custom and COTS power solutions, including AC power supplies, frequency converters, inverters, DC-DC, AC-DC, DC-AC, RUPS uninterruptible power supplies, and the VPXtra® line of VPX/VME power supplies. For more information, contact Behlman Electronics Inc., 80 Cabot Court, Hauppauge, New York 11788 USA; TEL: +1 631 435-0410; FAX: +1 631 951-4341; sales(at)behlman.com; http://www.behlman.com. 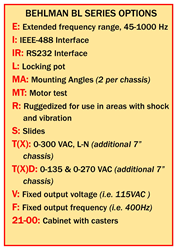 Options list shows the many ways a Behlman BL Series Power Supply can be customized. Behlman BL(F) High-Power Series Power Sources include fifteen basic fixed voltage and frequency models ranging from 1,000 to 20,000 VA. Options list enables these to be customized for any requirement.